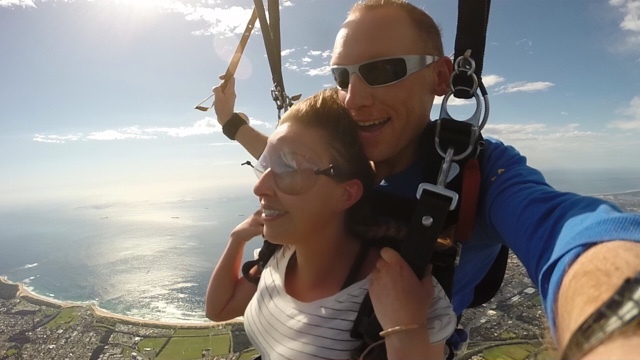 My First Skydive at Wollongong Beach in Australia with Video! So this is a post about my first skydive. I never pictured myself doing one to be honest so it came as a surprise to me too! 2015 wasn’t great for me. Determined to turn things around I booked myself a flight from Brisbane where I was staying to Sydney. At the hostel I checked myself into they gave me a leaflet with discounted trips and activities that we could do. One such activity was $30 off a skydive. I figured why not? I’d always thought I would be far too scared before but oh well, I am only 30 for a few more weeks so why not go out with a bang. How bad can it be? 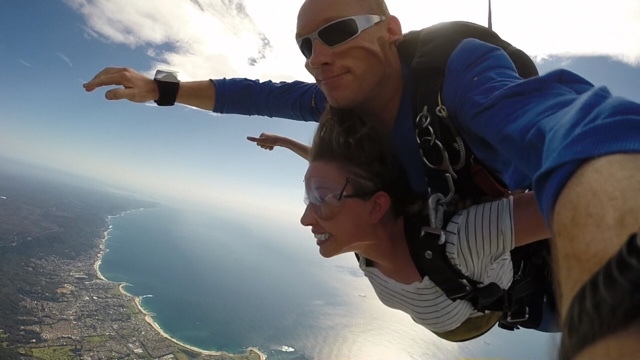 I booked with Skydive The Beach for 3 days after so I didn’t have enough time to try and chicken out of it! I did also edit the GoPro video I got after the jump and uploaded it to Youtube. I am no vlogger but I tried, I have put the link at the end of the video in case you would like to take a look. What happened before the jump? The day comes around and finally I let myself think about the jump, I had not really thought about it often on purpose so I didn’t worry. I worked out my only real issue is if I will throw up when we do the free fall as I have seen videos on youtube where you flip over repeatedly and this looked stomach churning. I went to the pickup point just down the road from my hostel at 6am and meet the lovely Kate. She’s also from England and we have a chat about random things to take our mind off it. The bus takes us on the long drive to Wollongong Beach which is about an hour and a half outside Sydney. When we get there we fill out some paperwork before being kitted out with some crazy blue trousers, our harnesses and a strange banana like bum-bag? I later found out contained a life jacket (since we were sky diving next to the sea)! I met my tandem instructor Andy who I was strapped to for the jump and am pleased to find he’s really nice and very reassuring. I mentioned to him I was only really scared about the initial free fall so he arranged for us to get on the plane last, so I jumped first. I was happy not to have to watch everyone else jump before and terrify me. Should I pay extra for the video? I decided to pay extra for a video of the jump, in case it was the only one I ever did I thought it would be cool to have the memories on video. Andy strapped on a go pro and did a mini interview of how I was feeling. Once kitted up and shown how to hold onto the harness and arch our back during the jump from the plane and how to spread our arms out when told during the free fall once we have stabilised we practised lifting up our legs for the landing and then we were off in the bus to the airport to get on the plane. Inside the tiny plane Andy got cracking checking my harness was tight enough and doing his own checks while I suddenly became really emotional and felt like I was going to cry as I just had an overwhelming feeling of I wish my Nan was alive so I could tell her what I was doing! No idea where that came from and I am sure, with hindsight, she would think I was barking mad! After that I felt fine and quite serene as we climbed higher and higher. As we got to 14,000 feet it was time to take the leap of faith! I laughed when I watched the video back as it was so funny! I hung my legs out of the door and then did a big deep breath to prepare lol! Then we were away! One second in the plane and the next I opened my eyes to see the world below me. But instead of terror I felt amazing! My second thought was omg my mouth is so dry! The wind against you is so loud and so strong that you don’t even feel like you are falling instead you feel like you are floating, it’s crazy and so serene, there isn’t that horrible tummy flipping feeling you get on some water rides or roller coasters. The free fall lasted about 60 seconds and then Andy deployed the canopy and we drifted slowly down to the ground. I just smiled and stared at everything as it didn’t look real. It was a funny feeling looking down, the ground below looked so far away. It didn’t feel like it was really happening. I loved looking out at the beach and the sea and all the houses and everything was so beautiful. We floated down gently and easily, I was even allowed to steer for a little bit and we did some spins. Spinning was really not my favourite part it has to be said! Before I knew it I was trying to lift up my legs for the landing. This was the only hard part as suddenly they felt very heavy! All too quickly my skydiving experience was over. Then all that was left was to get some food, wait for the video and then travel back to Sydney. If you are somewhere with an amazing view I really recommend giving sky diving a go. It’s definitely not that scary, especially compared to other extreme sports such as bungee jumping. You will feel like you are free and flying. My tip would be to smile as much as you can otherwise your mouth blows open and gets super dry! Would I jump again? I think I would. I would still probably prefer to jump tandem than relying on myself to pull the parachute chord! Have you ever done a skydive? How did you find it? My youtube video is below!